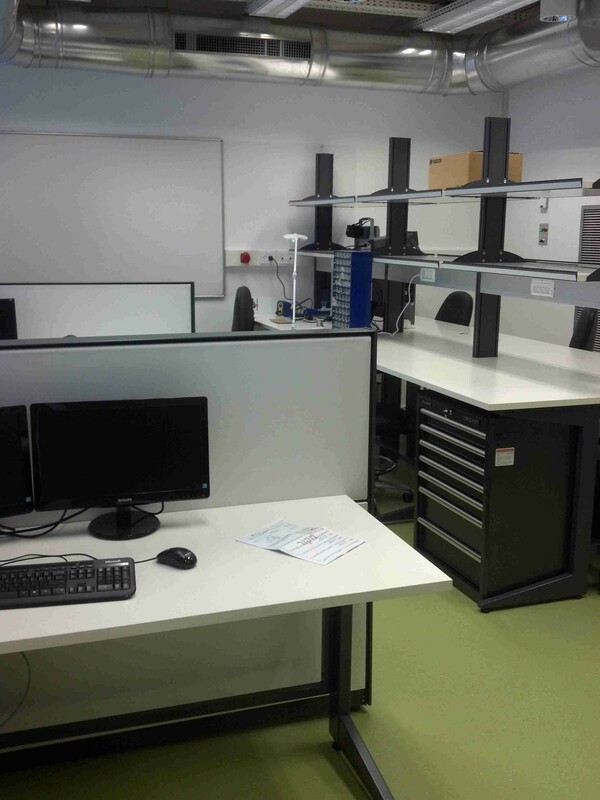 The Space Optics Laboratory is the second major laboratory located on ground floor of the ASRI building, immediately opposite the Electric Propulsion Laboratory. Interferometry seeks novel solutions for improving the angular resolution of telescopes for both astronomical and Earth observations from space. The resolution of a traditional telescopic imaging system is strictly limited by the size of the aperture and the color of light that is observed. Telescopes as large as 30 and 50 meters are currently being designed, but in space limitations on size and weight are severe. The Hubble space telescope, for example, has a mirror diameter of 2.4 meters. In order to minimize aberrations, the mirror needs to be thick, which costs valuable space and more importantly weight that the mission needs to launch into space. Telescopes much larger than Hubble, therefore, very quickly become far too heavy and expensive for space missions. Interferometry is a novel method aimed at increasing angular resolution without requiring prohibitively large mirrors or lenses. Instead, it uses several small apertures with large spaces between them, either simultaneously or sequentially in pairs. Owing to the wave nature of light, the coherent interference of light from these smaller pupils on a detector (camera) provides information about the image components that can exceed by far that which would come from the same size mirrors were they were bunched and assembled into a single telescope. Image processing of coherent light in an interferometer yields an image that has angular resolution lambda/D, where D now is the largest distance between the individual apertures (as opposed to the size d of each one). In this way, high-resolution images can be obtained using low-weight distributed optics. For example, a 2.4-meter diameter mirror weighs close to 3 tons, whereas three 10-centimeter diameter mirrors assembled on a 2.4-meter circle, provide the same angular resolution, and weigh less than 1 kilogram. The light-gathering power is of course diminished, but this can be compensated for by a longer exposure time, which is less of a problem for astronomical observations from space where the (varying) atmospheric disturbances do not exist. Moreover, placing telescopes in space allows observations at wavelengths that are heavily absorbed by the atmosphere (e.g., UV) and thus impossible with ground facilities. The Space Optics group at ASRI, headed by Dr. Erez Ribak from the Physics Faculty, is exploring various options of distributed optical structures to be constructed into imaging devices, by carrying out laboratory experiments with scaled down interferometers. Various configurations are being studied in which the resolution, light collection, area, and weight of the system vary along with theoretical investigations to establish the main options. Achieving constructive interference on the detector (camera) is quite challenging and requires almost perfect alignment as well as state-of-the-art (and expensive) adaptive optical components that can adjust and realign the mirror segments in real time. This challenge is further augmented when the separate telescope apertures are in motion when they are mounted on different satellites. Another version of interferometers to be tested at the Space Optics lab is the intensity interferometer, which measures on the detector the time varying intensity fluctuations from the separate telescopes. A correlation analysis then yields information on the spatial distribution of the source (e.g., a star or galaxy).The constraints on the relative positions of the various optical components are much less stringent in an intensity interferometer. Dynamical experiments of optics mounted on model satellites in motion are planned at the distributed space systems laboratory at ASRI.